The Graduate School and the Office of the Dean of the Faculty created the Deans’ Faculty Fellows Program for 6th year PhD students. The pilot initiative, which was announced in the fall of 2014, is designed to allow advanced graduate students to strengthen their teaching portfolios by developing their own courses in consultation with a faculty mentor. At the same time, this program will provide Brown undergraduates access to some of the University’s best new PhD’s. Each year up to 10 students who have achieved a record of excellence in teaching and scholarship will be named Deans’ Faculty Fellows (DFFs). To be eligible, rising 6th-year graduate students must commit to completing, defending, and submitting their dissertation by January 15 of their 6th year. The DFFs will be offered full fellowship support without any teaching responsibilities during the Fall semester. 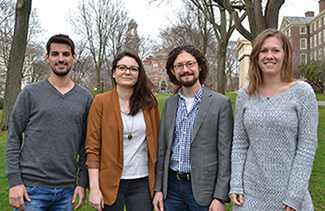 In the Spring semester, they will be appointed as Visiting Assistant Professors with assignments to teach or co-teach a course in their areas of expertise. Division of Biology and Medicine students are not eligible. Departments may nominate candidates for Deans’ Faculty Fellowships. The deadline for nominations is 5 p.m. on January 30. The nominations will be reviewed by a Graduate School, Dean of the Faculty, and faculty selection committee. The selection criteria will include the nominee’s accomplishments in teaching and scholarship, his/her plan for dissertation research in the Fall semester, his/her proposal for teaching in the Spring semester, and the department’s recommendation. The fellowship and teaching opportunity will be conditional on fulfilling all requirements for the PhD by January 15 in the 6th year. Students selected for the DFF program who do not fulfill this condition will not be appointed as a Visiting Assistant Professor and will not receive stipend support for the Spring term; tuition and health insurance will continue to be covered by the Graduate School during the Spring semester. Faculty advisors will be asked to confirm in early December of the 6th year that the student is on track to complete his or her PhD requirements. The program is open to students of all nationalities. However, international students will have to arrange for authorization for employment in the Spring semester (Optional Practical Training). Please note that many students are limited to just 12 months of OPT, and the appointment as a Visiting Assistant Professor will count for 6 months of the OPT. Interested international students should consult in advance with the Office of International Students and Scholars about the possible need for immigration sponsorship, such as the H-1B visa. All nomination forms can be completed through UFunds. Step 2: Department Chair receives an email prompt to complete the Department Nomination Form through UFunds. For reference, see the list of questions in advance. All application materials are due January 30.